If there’s one thing we’ve learned, it’s layer, layer, layer. A classic crew in a statement stripe is always a kid-favorite. If your kiddo’s school has a dress code, cool kicks are the perfect way to make a style statement. We know even the most frigid temps aren’t going to stop them from playing on the yard. Try a puffer vest to keep your kids toasty without the extra bulk of a full jacket. The ultimate school-day staple in styles from super skinny to flare and washes from faded blue to deep indigo. Get your kids excited about the dress code by letting them pick their favorites. Check with your school to see if they allow fun accessories so they can make the looks their own. Calling expert twirlers! We love this tulle skirt— just add tights for chilly days. Stock up­—these wardrobe wonders are essential to your kids’ fall looks. 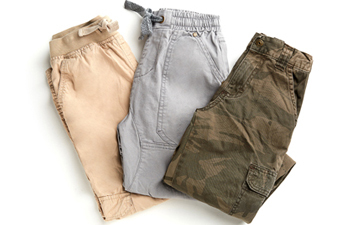 Joggers, khakis, and cords for off-denim days. After-school activities call for something a little more relaxed and comfortable like favorites from Nike and Adidas. The easiest one and done style for fuss-free mornings.